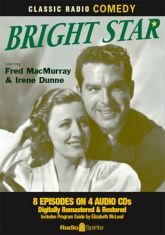 "Starring Irene Dunne as Susan�and Fred MacMurray as George�together in a gay new exciting comedy adventure�Bright Star!" Bright Star chronicles the happenings at the offices of The Hillsdale Morning Star, a small town newspaper owned and edited by Susan Armstrong. Played by Irene Dunne as a no-nonsense professional, Susan nevertheless has a sweet spot for her star reporter. George Harvey, played by Fred MacMurray as an energetic and competitive journalist, challenges, bothers and bewilders his boss at every turn. Personal chemistry charges the plotlines, with MacMurray and Dunne bouncing off each other like a role-reversed Tracy and Hepburn. Susan's sardonic housekeeper, played by veteran character comedienne Elvia Allman, adds further snap to the proceedings. And, together, these charming characters make headlines!